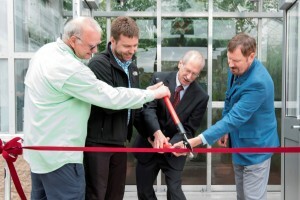 On May 5th, the ribbon was officially cut at a Student Open House for the Liberty Hyde Bailey Conservatory. 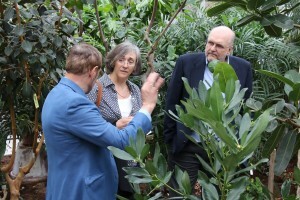 Alan Collmer, Glenn Evans, Kevin Nixon, and Ed Cobb acknowledged the hard work of Capital Programs managers and directors, Cornell Agricultural Experiment Station employees, plant science undergraduates, and the many people who advocated for the rebuilding of the conservatory. The Liberty Hyde Bailey Conservatory is located adjacent to Plant Science Building, 236 Tower Road on the Cornell campus. The new conservatory replaces a wood framed conservatory structure that occupied the site until 2010. 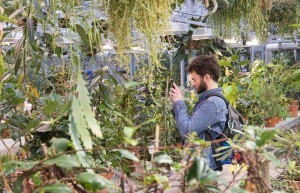 The collection is made up of more than 600 plant species and is open to visitors most weekdays from 10:00 am – 3:00 pm. Individual plants, families, and collections are labelled with QR codes which can be read with a QR scanner app on your smartphone.